Posted on 01-28-16 at 4:36 p.m. There can sometimes be a perception – conscious or not – that the United States sees Canada as little more than its natural, northern (and colder) extension. However, Canadians have a long history of claiming their independence and distinctiveness from their southern neighbours, and our Panorama survey shows that very real differences exist and subsist between the two largest trading partners in the world. Any American player seeking to make an imprint or build upon one in Canada will start at a significant advantage over its competitors if it is aware of the characteristics that make the “Great White North” a truly distinct society in the North American landscape. Embracing people’s uniqueness and diversity – as well as learning from it – is an integral part of Canadian identity. Canadians score considerably higher than their neighbours to the south in assigning value to concepts like Equality of the Sexes, Flexible Definition of Family, Flexibility of Sexual Identity, and Openness toward Others, expressing a desire to distance themselves from social models and molds to validate individual particularities that they perceive as a source of social richness and personal fulfillment. When possible, those seeking to win over the Canadian marketplace should therefore be not only willing, but eager to display receptiveness to difference and to offer goods and brand images that play well to demands for personalization and customization. Consistent with a more humane, people-oriented mindset, Canadians are more apt than Americans to want to help others and tend to be more sensitive to issues affecting the world around them – be it in terms of their community or the environment. Concepts like Primacy of Environmental Protection, Ethical Consumerism and Mutual Aid resonate significantly more strongly north of the border. For instance, whereas only 29% of Americans “totally agree” that they should help people around them even if they don’t know them well, close to half (44%) of Canadians do. And while close to a third (32%) of Americans are willing to accept higher degrees of pollution to preserve people’s jobs, only a meager 19% of Canadians share this view. In this sense, social and ecological sustainability play an important part in Canadians’ choices of brands and products. Despite market forces and the unpredictability of life today, Canadians have the impression that they can stay on top of things. A significantly smaller proportion of Canadians (45%) than Americans (56%) agree with the idea that they have a hard time changing the course of events affecting them. But despite this feeling of control, Canadians are less comfortable that Americans with uncertainty and risk-taking, being almost twice as less inclined to take risks in life than their American counterparts. In this sense, comforting brands and comforting brand promises are especially welcome by Canadian consumers, as well as promises of empowerment. More to the point, as a direct by-product of this pronounced sense of cautiousness, Canadians are also more financially prudent and pragmatic from a consumption standpoint in comparison with Americans; price is a more important factor for them in their purchasing decisions, whereas a product’s brand is less so. A total of 43% of Canadians totally or somewhat agree that when they buy a product, the brand is very important to them, a proportion that goes up to 58% across the border. They do not engage in “buying for buying’s sake” to the same extent that Americans do and they are more wary of marketing and advertising; only 12% of Canadians believe that if a product is widely advertised, it is very likely that it will be a good product, while 39% of Americans share this opinion. Therefore, Canadians are more likely to consider any offer as a commodity and to be attracted by the best price. To make itself known, a brand therefore has every interest in having a somewhat aggressive pricing strategy or, if inclined to charge a high price, one has to be quite convincing about the concrete value being offered in return. Any company seeking to do business with a specific segment of Canadian consumers would gain by understanding where they come from as people. In the end, it all comes down to knowing your end client. With its Panorama program, CROP is uniquely equipped and positioned to help you do so. Posted on 01-28-16 at 2:53 p.m. Although Canada and the U.S. are neighbouring countries and are the most important trading partners in the world, they are nonetheless quite different in terms of consumer values. Any player from “The Great White North” seeking to make an imprint or build upon one in the “Home of the Brave” must be aware of U.S. consumer differences so as to adapt its offer and brand promise. With its unique Panorama program, CROP offers its clients an in-depth look at the ways in which U.S. consumers differ from their Canuck counterparts. The generalized perception that Americans give considerably more weight than Canadians to moving as high as possible up the social ladder and earning the lifestyle that should come with it is strongly justified when we compare how Americans and Canadians define the life principles that are important to them. Americans not only engage in the quintessential “keeping up with the Joneses” phenomenon – they aspire to surpass the Joneses. Concepts like Ostentatious Consumption, Need for Personal Achievement and Concern for Appearance resonate significantly more strongly south of the border with, for example, 36% of Americans considering it important that people admire the things they own compared to only 21% of Canadians. U.S. residents are also considerably more willing to go all out in order to move up: proportionally, twice as many Americans (56%) as Canadians (29%) say they are prepared to take big risks in life to achieve their goals. At the same time, life in America is seen as eventful, unexpected, even sometimes in turmoil. Americans view the world as filled with uncertainty and in a state of perpetual change. That said, Americans feel they can adapt to anything – if properly equipped to face it. As one of the fundamental characteristics of the psyche of our southern neighbours is to strive to succeed under challenging conditions, brands promising to provide consumers with levers to climb up the social ladder, to adapt to uncertainty, and to attain an enviable social status are bound to play well to the American ethos. Predictably, Americans also show greater confidence in business and place more value on corporate success than Canadians do. The United States prides itself on being a business-friendly environment – putting the priority on wealth creation, with social and/or ecological issues sometimes coming second. For example, while a meager 19% of Canadians are willing to accept higher degrees of pollution to preserve people’s jobs, close to a third of Americans (32%) share this view. Although consumer expectations are growing when it comes to social responsibility, the United States remains fertile ground to flaunt a brand’s background and/or its “success story” rather than making its social responsibility actions spearhead its marketing strategy. Our results also clearly support the belief that America is the land of consumption: Americans essentially invented the consumer society, and it is deeply ingrained in their values and attitudes. When compared to Canada, concepts like Joy of Consumption, Importance of Brands and Pursuit of Novelty, are through the roof in the United States. Americans place an extremely high premium on shopping, innovation and gadgets, and associate them with greater social status and personal success. A much higher percentage of U.S. residents (55%) than Canadian residents (32%) state that they like being immediately informed about new products and services so that they can use them. An even larger proportion of Americans (60%) also state that buying themselves something is one of their greatest pleasures in life, compared to 42% of Canadians. To come out a winner in this territory, brands should therefore not skimp on marketing and innovation efforts in order to give the impression that they are continually renewing and improving themselves, and, by doing so, offering new possibilities to their consumers. One should also not neglect Americans’ more pronounced and deeply-rooted socially conservative values. They have a stricter definition of family (51% believe that getting married and having children is the only real way of having one, in contrast with 39% of Canadians), are less likely to believe in total equality of the sexes (44% think that men have a certain natural superiority over women, in contrast with 23% of Canadians), and are more likely to believe in patriarchal authority (55% agree that the father of a family must be the master in his own house, in contrast with 19% of Canadians). While diversity and openness to social change are in some respects on the rise in the U.S. (for example, the legalization of gay marriage nationwide), it remains a more conservative society overall. Brand images reflecting traditional social models tend to be, in this sense, a safer bet, generally speaking. While this text gives a general overview of the U.S. market, keep in mind that regional differences are extremely marked and each target segment has its unique mindset that our Panorama program can help you interpret. Posted on 01-28-16 at 1:50 p.m. The Liberals’ rise to power at the federal level has had a very positive effect on the mood of Quebecers; it’s being received as a real breath of fresh air. 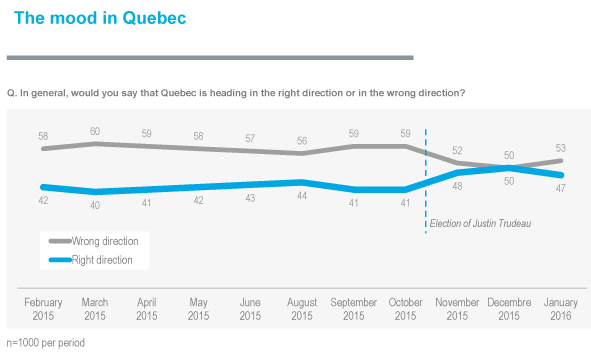 Since the Liberal Party was elected, nearly the majority of Quebecers feel that Quebec is going in the right direction. This sunny attitude is reflected in provincial politics, as a happy population is less likely to want a change of government and signs regarding the QLP are quite favourable. Two years from the next election, the most important indicator is the satisfaction rate with the provincial government, which is very close to 40% -- a comfortable margin for the Liberals. After a difficult 2015, a year of budget cuts and negotiations with its employees, the QLP is kicking off the year supported by its electoral base. As for the official opposition, it has lost 8 points in the past two months and is currently at its lowest rating since Pierre-Karl Péladeau’s debut as party leader. Moreover, note that data collection was conducted before the nightmarish last few weeks that the leader of this party has experienced. In the last few days, Mr. Péladeau has been unable to exercise his position as leader of the opposition, as he is entangled in defending his other roles, that is, either his role as controlling shareholder of Quebecor or his role as a celebrity who broadcasts his private life and is suffering setbacks in his love life. The PQ’s descent benefits the CAQ and Québec Solidaire. Figures for Justin Trudeau’s Liberals are stratospheric. Two out of three Quebecers feel that they are doing a good job and they have the support of half of Quebecers when it comes to voting intentions. The NDP has an electoral base of 20%, which means it has the support to rebuild when the honeymoon is over for the Liberals. 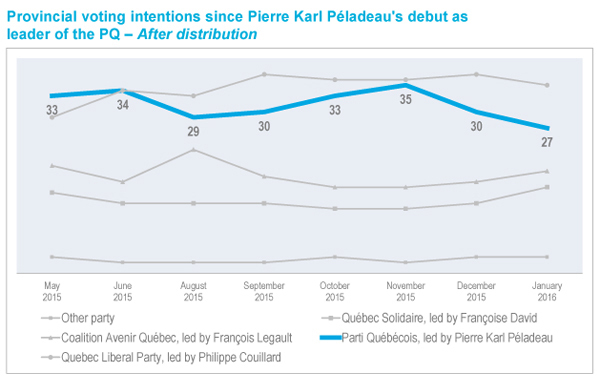 However, at 11%, the Bloc Québécois has returned to the margins following Gilles Duceppe’s departure. Posted on 12-11-14 at 11:42 a.m. Thank you for participating to this year’s Panorama study on the purchasing habits and the values of Canadians. Winners will be notified by phone and by email within two (2) business days following the date of the draw and the prizes will be directly mailed to the home addresses that were indicated to CROP. Thank you again for your valuable contribution to our study. Best wishes for 2015 from CROP! Posted on 01-06-14 at 4:35 p.m. CROP is announcing the list of winners from those who participated in the pan-Canadian survey on values and habits! The winner of $10,000 in cash is Marilyn Bowman. CROP will contact all winners in the next few days.